→How To Connect Multiple LED Strips to Power Source? LED strips are widely known to be used as a form of light source. Its presence can be seen within households, building décor, prototype, or even on some mode of transportations. Though, even with its various usage, knowing the proper installment is crucial to ensure that the potential functions within its usage are met. Furthermore, as you are finding the preferred LED strips which can be suited for you and your envisioned setting, the first thing that should be taken into consideration is the question "How do I operate this?" or "How do I light up the LEDs using the power source at hand?" Worry no more! For to achieve the incandescence and aesthetic vibe of LED strips, the text will guide you to the information regarding proper connection and its instruction. Choose the LED depending on your preference, but you should take into account the specifications on the strip when choosing for your power supply. The supply can also be either electricity straight out of the socket aided by a transformer or using a battery depending on the flexibility of the chosen strip. It is essential to comply with this occurrence, as the failure to consider can lead to the malfunction of the LED strip. The compatibility of the power supply should be ensured for it to be used. Also, if the criteria needed are not met, the LED strip function may not be in its optimum state. They may flicker, dim, or not light up. It is mostly indicated on the packaging or instruction manual, if available. The 80 percent rule states that during the function, it is best to use the power source 80 percent of the way especially for batteries to increase the maximum longevity. Also, the occurrence of overheating would most likely be prevented or lessened. The type of installation is known to be the easiest among all techniques. To acquire this, connect the main supply to the input terminal of the LED transformer. Then, connect the starter-lead of the LED strip to the output terminals of the transformer. More LED strips can be attached if the power supply and the transformer is powerful enough to support it depending on output wattage. To connect the multiple strips, a connector-block is used which is known to split the power supply into many outputs. Specifically, you need to attach the input terminals of the transformer to the main supply voltage, mostly around 240V depending on the kind of lighting. Then, the terminal output should be connected to the input of connector-block. Also, the wire each LED starter-lead should be attached to the output of the connector block. Keep in mind that the connector-block needed depends on the number of outputs. An example of this is if three LED strips are needed, then choose a connector-block with three outputs. An LED controller is needed to control the colors existing beneath its function. It is located mostly in between the power supply and the LED strip. To connect the strip to the power supply, the output terminals should be connected to the controller, whereas the input terminal should be attached to the main supply. For a wireless controller, a receiver is needed to have a signal. Most LED receiver can be controlled for up to 20 meters and has some functions depending on availability such as adjusting colors, dimming, and running lighting effects. Also, the channel you wish to control depends on color, as one color LED can be controlled by one, as RGB LED requires at least three channels on the receiver. To have this, all you need to do is to add a dimmer suited for your installation. Specifically, you need to connect the dimmer to the transformer. To do this, all you need to do is to attach the input terminals of the transformer to the main supply, then also connect the output terminals to the dimmer at inline. If using a wireless dimmer, then adding a receiver is essential to receive the wanted signal. You may notice a voltage drop occurring when the length of the wire seems to have brighter lights at its first segment, then gradually dimmers as it travels along the length of wire. It is often not an issue, but some want an even distribution of lighting for aesthetic purpose or to unleash the maximum potential of the LED strips acquired. 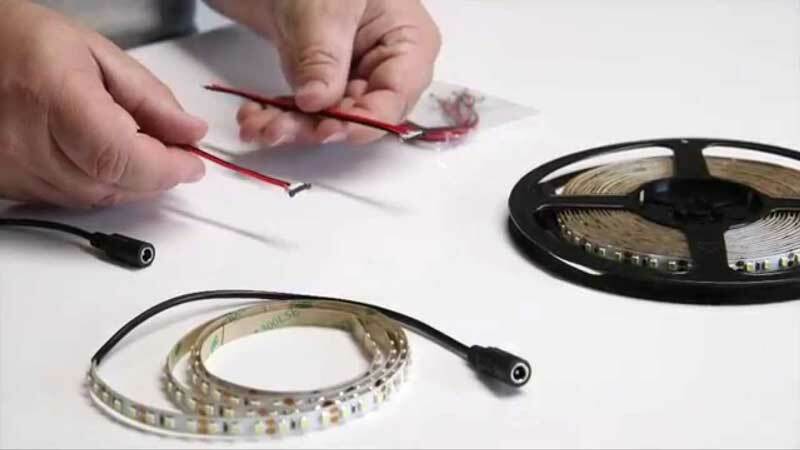 The length can be considered as "too long," and to compensate, divide the LED strips into shorter length then add parallel wires from the power supply to each shorter version of the LED strip. This repetition of the process can be done ensuring proper connection wire gauge. You can install parallel circuits either by parallel lines at a longer distance or splitting the runs in different directions. For long distances, the power supply is located at the end of the connection, with each having wires from the base wire or first segment wire attached from in between the strip connection. Meanwhile, splitting the runs means that the power supply is in between the division of at least two long strips. 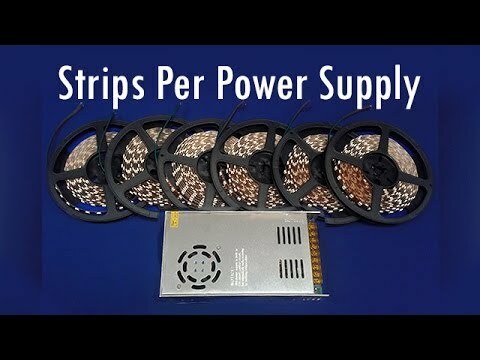 For example, 60 feet LED strips can be divided into 30 feet strip, then located at the sides of the power supply. For RGB lights, an RGB controller is present to introduce color change or dim the lights. To still acquire the wanted function while doing the set-up in parallel to avoid the voltage drop, the signal should be transferred from the first run to the second run of the strip. To do this, an amplifier is most likely used and installed. This can also be done for those that have one color LED lighting but have dim capabilities. Final Thoughts: Having A Bright Idea! Knowing how to operate and address the power supply for your LED strip lighting can help you find any mishaps that may occur later on. The lights are dim or some of the parts in the LED strip is not lit, this can only mean something is wrong with the voltage power supply. It can also help in the pre-installment case, especially if you are the one who will install it. Also, you should always be mindful regarding the voltage requirement of the LED strip. This implies that the strip should be selected first before the power supply to ensure its capability. Now that you know how to connect and attach different kinds of LED strips to the power source to function, install one now!